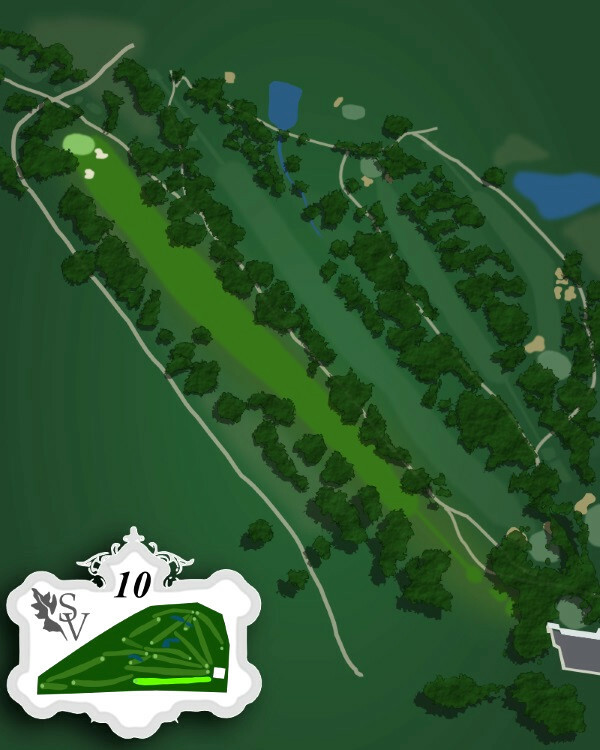 Including maps, stats, and pro tips for every fairway. Swipe the map left or right to change holes. Click on the Hole Number, or the Prev / Next buttons change holes. Handicap is 9 for both the men and women.This first hole is a straight away par five, reachable in two for the long hitter. For your lay-up shot, beware of the hidden lake that is in the left rough, 75 yards short of the green. Other than that, hit it straight and you will be fine. Your uphill approach shot to the green is challenged by two right-side bunkers and a bunker behind the green. This green slopes from back to front, so staying below the pin is the place to be. Handicap for men is 7, for women is 5. Hole two is a good par four. On your drive, watch out for the oak tree that guards the right side of the fairway. You'll need a well-placed drive and second shot. Bunker guards the green on the left. The green on hole two slopes from back to front and left to right and is guarded by a bunker on the left and an overhanging oak on the right. You'll definitely want to be below the pin. If the flag is well back, make sure your putt gets there! Handicap for men is 1 and for women is 13. This is the longest par four on the course for men. For women, this is a par 5. The fairway shapes slightly to the left. Extremely errant drives could end up in the yards of the townhomes that flank the right side of the fairway. The fairway on Hole 3 is the only fairway on the course with homes alongside. Keep your approach shot toward the right, as the left side of the green is guarded by a deep bunker. The green slopes from left to right and back to front. Handicap for men is 17 and for women is 3. All tee locations except the forward tees hit over water. The fairway is lined by thick trees both left and right. Aim your layup short of the cluster of three bunkers on the right. A trio of right-side bunkers will challenge your approach to the green on Hole 4. The green slopes from left to right and back to front. 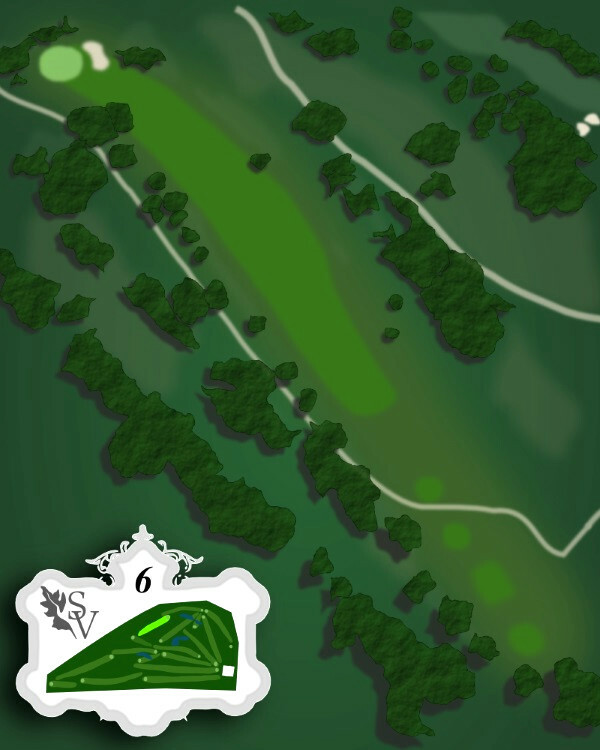 Stay below the pin for your best chance to make this makeable par 5. Handicap for both men and women is 15 on Hole 5, a short par three. Get a good read from your GPS at the tee, as club selection is critical to success with a bunker placed mid-fairway, and one on each side of the green. Restrooms and the snack bar are located on hole 5. 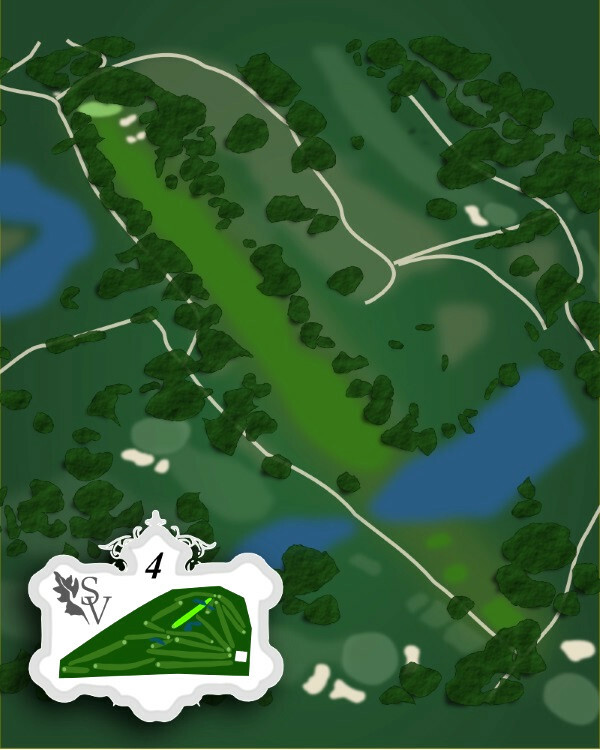 The green on Hole 5 slopes from back to front, but if you overshoot the green on your drive, you'll be challenged by several small collection areas resulting in a tricky chip to the pin. Handicap for men is 13 and for women, 11. You will want to keep your ball to the right, as an arching oak tree watches over the approach . With the oak tree on the left, and a bunker on the right, an accurate approach shot is definitely needed. If your approach shot goes far over the green, you'll end up in a deep out of bounds area. The green on Hole 6 slopes left to right and back to front. Chipping from the newly-renovated green-side bunker on the right will be your biggest challenge on this green. Handicap for men is 3, and for women 1. Hole 7 dog legs severely to the right, and your tee shot is a blind shot up a hill, with oak trees right and left. A long tee shot could end up in the water on the far right. Long hitters can cut the corner of the dog leg, and short hitters, placement off the tee is critical to manage a clear approach to the green.. This green is heavily sloped from back to front. You'll want to stay below the pin for certain, below and right if you can manage it. 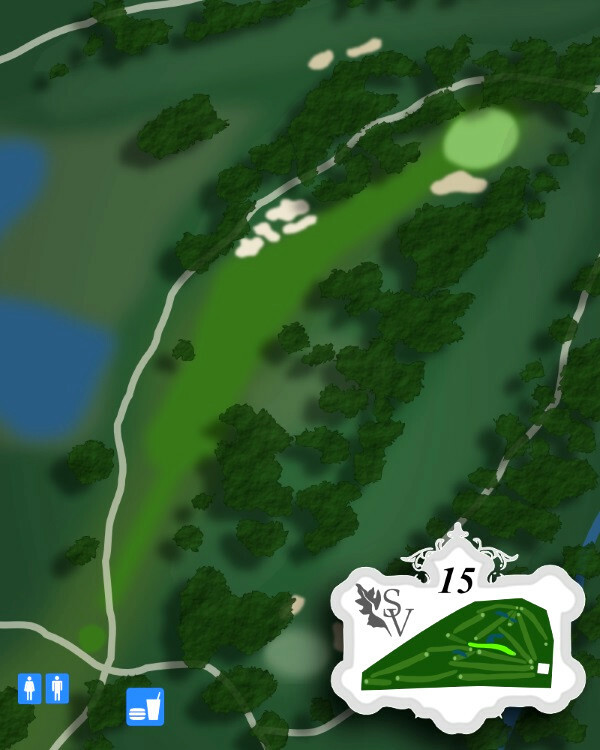 There is a deep, lipped bunker on the right of the green that will give you heartburn if you end up in it on your approach. Handicap for men is 11, for women handicap is 17. From the farthest tee location, this is the longest par three on the course. All tee locations require a tee shot over a pristine lake. From the forward tees, the tee shot is considerably uphill. Play it longer than you'd think. Stay out of the bunkers on the left of the green, and you'll find this green to be very puttable, very true. Handicap for men is 5 and for women, 7. This is a tough par 4 and few women golfers can reach the green in two. With thick woods on the left and two fairway bunkers on the right, your tee shot needs to be mighty accurate..
One of the few tiered greens on the course, Hole 9 will give you a lot to think about. Pin forward? Land your ball close to the front fringe. Middle or back pin? Get your approach shot above the top tier or it will roll back down to the front fringe. You do not want to be above the hole on #9. Oh, and there is a green-side bunker on the right. Handicap for men is 18, 14 for women. This hole is a nice opening for the back nine, reachable by long hitters. From the forward tees, aim your drive toward the left 150 yard marker or your ball will roll into the right rough. Lots of eucalyptus trees line the fairway. Number ten's green, like so many on the course, slopes gently left to right and back to front. The apron of the green is flanked by bunkers both left and right, one lying about 50 yards short of the green. Handicap for both men and women is 4, and is a challenge for both. You'll encounter out of bounds along the left, and the right side is a series of collection areas and trees. Two new fairway bunkers on the left are in play from all tee locations. The green is small and guarded by overhanging oaks on the left, and a bunker on the right. Long approach shots tend to overshoot the green into a huge dropoff area. Handicap for men is 8, for women is 18. But women, don't let that lull you into complacency. This is a difficult par three. Anyone making par here has bragging rights. One of the toughest greens on the course, it slopes severely from back to front, making putting a real challenge, especially if you land your drive in the big-faced green-side bunker on the left. Handicap for both men and women is 2. 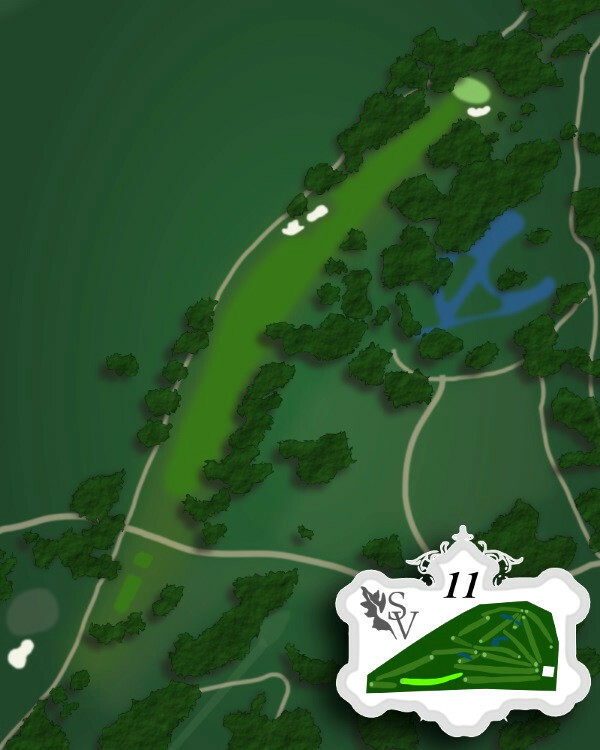 Hole 13 is a very narrow par four with a creek along the left side of the fairway, and two big oak trees on the right. If your drive goes way right, your second shot will likely be a blind shot to a difficult green. 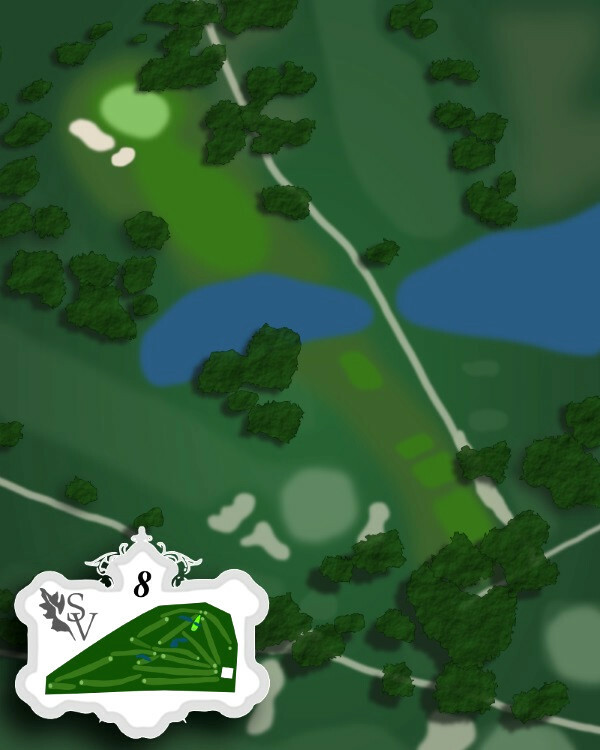 The reason this hole is such a challenge is, in part, because of the green. One of the few undulating greens on the course, it's a bear if you are not below the hole. From the top tier, the green slopes dramatically left to right, and guess what? There is a bunker on the left and a bunker behind the green. Walkers will find the trek from the green to the next tee is a real uphill challenge. Handicap for men and women is 10. 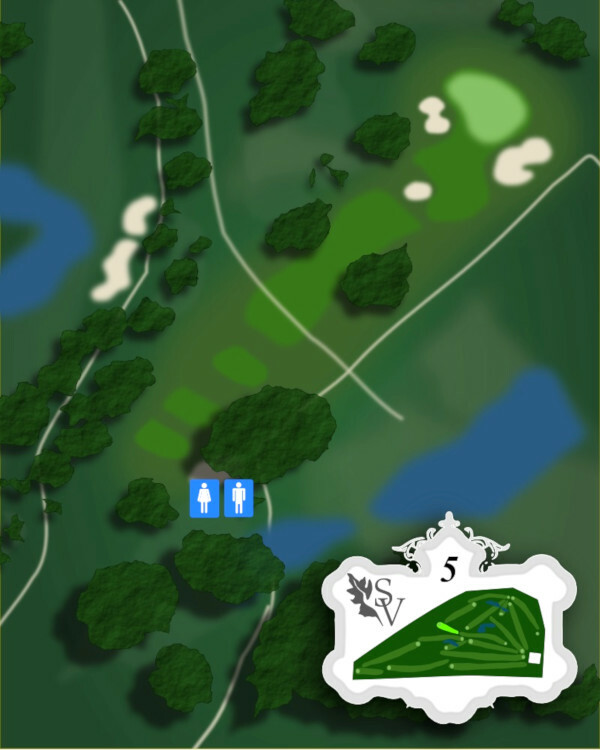 Long hitters will try to drive the green on Hole 14, but a less-than-perfect shot will find the player either in the lake on the right or the fairway bunkers on the left. This hole is a great risk reward opportunity. Handicap for both men and women is 12. This is a short par four that doglegs right. Place your drive just short of the cross bunkers on left. From there, a short approach shot, placed below the hole, will give you a good result. Restrooms and Snack Bar are near the tee box. Another very heavily sloping green, back to front. Stay below the pin for sure. Handicap for men is 14, and for women is 6, mostly because the forward tee location offers very little advantage from the back location. The fairway is extremely tight, lined on both sides by trees, and your second shot is uphill to the green. This green is one of the few truly flat greens on the course. Also one of the few where your approach shot might be blind. You should be able to see the color of the flag from your approach shot, but be aware that you may not see the green-side bunkers on the left and right. Handicap for both men and women is 16. This is Sierra View's signature hole. All tee locations drive the ball over a beautiful lake. From the forward tees, the tee shot is dramatically uphill. The snack bar is located at this tee box and you can access ice and water. If you are fortunate enough to land on the green on Hole 17, you will have avoided the large, deep bunker on the right and the overhanging limbs of the ancient valley oak tree on the left. This green is fairly flat, sloping gently from back to front. Handicap for men is 6 and for women is 8. This hole is a stern test to finish your round. It is the longest par five on the course and presents challenges from the start, with a creek along the left and trees left and right. From the back tees, the player must shape their shot over or around the oak tree on the right. What a way to end your round - this green is protected left and right by bunkers. The green slopes quite steeply back to front.